The Williams sisters got off to a rough start at the Rio Olympics. They both missed out on medals during their singles match-ups, and lost an Olympics doubles match for the first time ever. 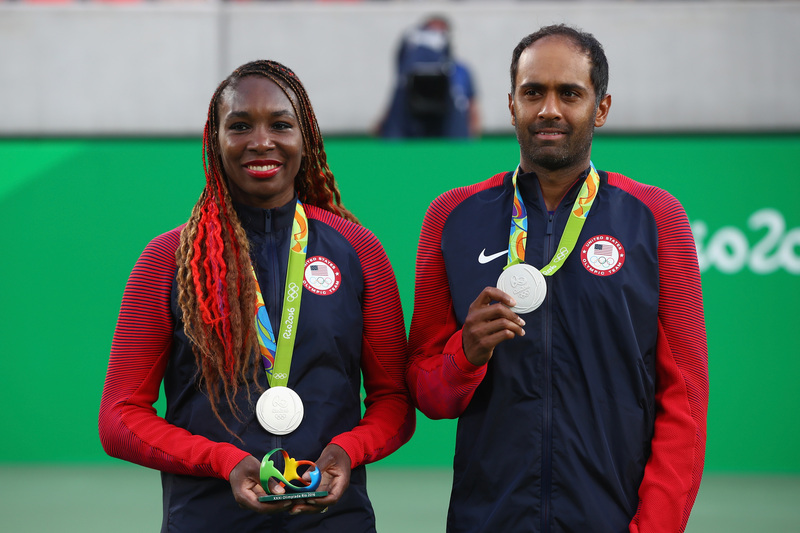 But at what could possibly be their last Olympic Games, at least one of the sisters made it to the podium: Venus Williams and Rajeev Ram won a silver medal in mixed doubles. As two Americans of color — Williams is African American and Ram is Indian American — the pair's victory was a beautiful celebration of diversity. Colorlines' #POCMedalWatch indicates that Williams and Ram's silver medals are among the 30 medals won by American athletes of color, making up almost half of Team U.S.A.'s 69 medals overall. Williams and Ram lost out on the gold in a historic match against fellow Americans Bethanie Mattek-Sands and Jack Sock. Had Williams and Ram beaten their opponents, Williams would have become the first five-time champion in Olympic tennis history, as well as the first player to win gold medals in singles, doubles, and mixed doubles. She and her sister, Serena Williams, are both tied at four Olympic gold medals each. But that doesn't make Williams' silver medal achievement any less significant. Williams wasn't even planning to play mixed doubles, the Chicago Tribune reported — she was recovering from a virus when she arrived in Rio — but after her singles and doubles losses, she and Ram teamed up and worked their way up to the final match. Williams has never lost an Olympic final before, but The Indianapolis Star reported that Williams still managed to tie with Great Britain's Kitty McKane for highest number of medals won in Olympic tennis. McKane won five medals back in the 1920s, one of which was gold. What's more, Williams told Star that she and Ram formed "an amazing partnership," and she hasn't entirely ruled out competing in the 2020 Olympics in Tokyo. "It's been an amazing experience, five Olympics for me," she told the Star. "It's surreal that I even came out with any hardware at all." Ram, meanwhile, was invited to Rio shortly before the Opening Ceremony after Bob and Mike Bryan — who were the doubles gold medalists in 2012 — withdrew. It was his Olympics debut, and he told Star that competing on Team U.S.A. is much different from the Association of Tennis Professionals world tour. "Tennis is a slightly different sport to most others in that we don't play team events ever. To be on a team and to play for your country, and to play for something bigger than yourself is special," he said. "And, obviously, to win a medal is right up there with anything else I have done. It's so different, the pressure is so different." As a result of their second-place finish, Williams and Ram have joined a number of other American athletes of color in medaling at the 2016 Rio Olympics — an enormous accomplishment that is both historically significant and worthy of recognition.